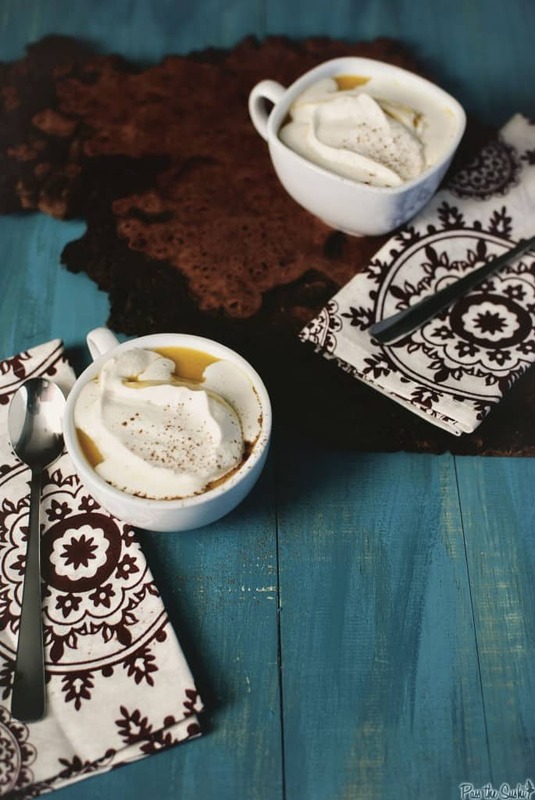 This Sweet Potato Soup with Maple Cream will warm you through this holiday season. It is like having a slice of pie in a mug. It is that good. Welcome to the Virtual Surprise Baby Shower for Rachel! Rachel is the champ who runs Rachel Cooks. And her popcorn craving have been driving me crazy since she announced that she was expecting! 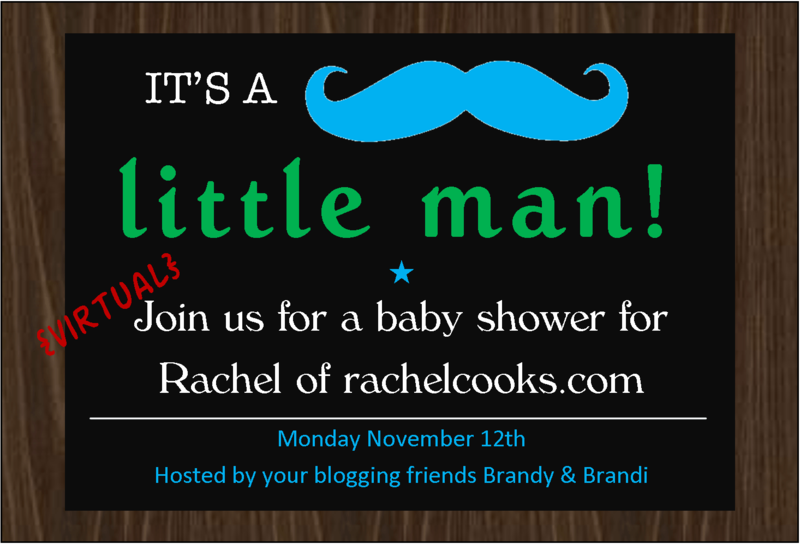 We wanted to celebrate Rachel’s new bundle of joy by linking up and throwing her an online shower. 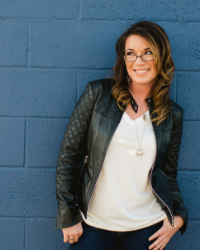 I always give it up for momma’s that also run blogs. Honestly, I can’t even begin to pretend I know how rough it can be! I fall behind on posts and my kids are all furry and bathe themselves (well, for the most part). Rachel is always whipping up show stopping food like this, and this, ooooh yeah and we can’t possibly forget that! She also hosts regular interviews with other bloggers. Just one more thing about her blog I totally dig. So sit on back and enjoy all the food we brought to table! I made soup for my step sisters bridal shower, and it was a hit. Now, I can’t imagine throwing a party without a soup option. I stacked mugs near a crock pot set to warm so that people could help themselves throughout the day. If you’ve tried this Sweet Potato Soup with Maple Cream recipe, or any other recipe on passthesushi.com please don’t forget to rate the recipe and let me know where you found it in the comments below. I love hearing from you! You can also follow along for more good eats and travel tips on Instagram @passthesushi & @girlcarnivore, Twitter & Facebook. In a large stock pot or Dutch oven, heat olive oil over medium-high heat. Saute the onion and leek about 3 minutes, or until softened. Add sweet potatoes, vegetable and chicken stock, salt, and cinnamon stick. Bring to a boil. Cover and reduce heat and simmer about 40 minutes, until sweet potatoes are fork tender. Discard the cinnamon stick. Process the soup in batches with your blender (use caution when blending hot liquids!!!) or with your immersion blender, until thick and creamy. Return liquid to pot and stir in cream, vinegar, nutmeg, clove, cayenne, and pepper. Heat through, but do not let boil. In the bowl of your electric mixer fitted with the paddle attachment, whisk cream on high until soft peaks form. Slowly add maple syrup and salt. Whip until just combined being careful not to over whip (dry peaks). Serve soup with dollops of cream on top. For leftovers sake, i just stirring the remaining cream into the soup letting it melt evenly. When reheating, microwave on low power stirring every 40 seconds until heated through. Now go check out all the other goodies my fellow amazing bloggers brought to the party! Love love love this soup. I hate sweet potatoes but oddly enough love them in a creamy soup. What a great addition to Rachel’s shower menu! Oh girl, I love that big dollop of goodness on top! This looks wonderful!! Happy baby shower day!!! I was searching for a good sweet potato soup recipe recently. I’m excited to try this one! Maple Cream! Oh wow, that’s genius. Looks amazing! OH I could easily do this. All night long. HAHAHHA. yep. that just happened on your comments. I love soup and this would be a luscious option that I would surely dive into first! I love fall soups! This looks amazing. I’ve never been to your blog! love it here ; ) so nice to meet you at Rachel’s shower! This soup looks amazing! I agree about having a soup option. It’s always so comforting and I love the warmth in the cold weather. Thank you again for participating in the event! This looks amazing! 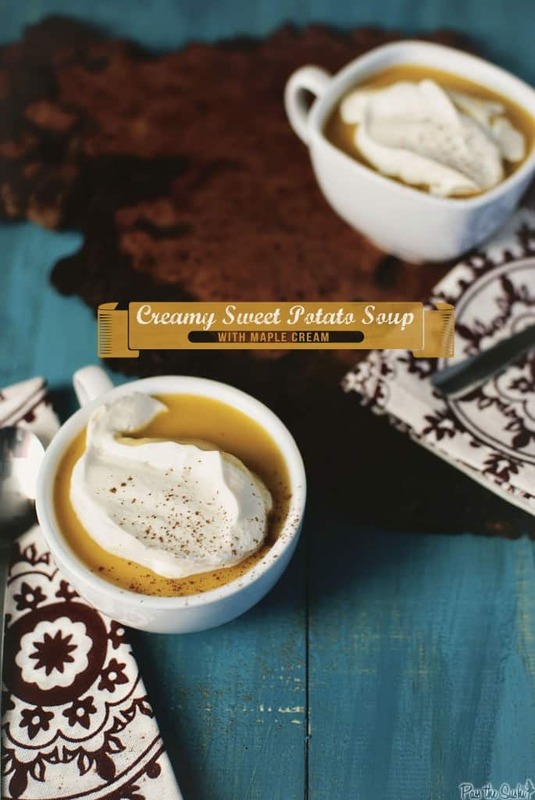 I have been on a sweet potato kick lately and incorporating in soup sounds fantastic, especially topped with maple cream! SOUP!!! Two bowls for me please! You had me at Maple Cream…must make! Oh my goodness gracious! This looks heavenly! I made sweet potato bisque for the first time last week – yum! Love your idea of maple cream on top. I would never have thought to serve soup at a shower, but it’s really a great idea. I never think of making soup for a party but it’s such a good idea. This soup sounds just perfect for fall. I would eat this every day, Kita. Beautiful! I’ve never had sweet potato soup, but I think that I would LOVE it! This looks incredible! 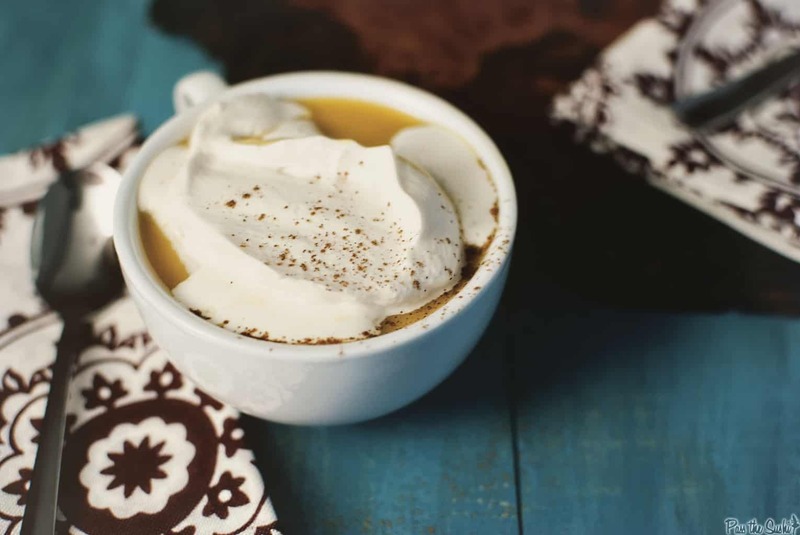 How smart to have soup in the crock pot for everyone to help themselves and that maple cream has me wanting this now! I love the idea of having soup for a baby shower – and this soup sounds completely amazing!! Wow, I’ve never made sweet potato soup – it’s a great idea! And the maple is a perfect addition! So perfect for fall and winter. Maple cream!? Heck yes! Love this combination! Um… you blew my mind with this. Sweet potato soup AND maple cream??? Seriously girl, I cannot wait to meet you at MixedCon! this is gorgeous! and maple cream? i’ll just take a bowl of that with a spoon.